CJ came up with the idea of making Triangle shape with pencils when I was busy creating Rainbow pencils for Valentine's Day. 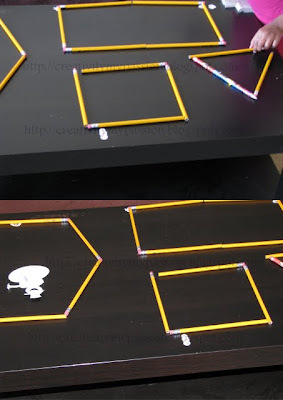 Then I joined with her and we created Rectangle, Square, Hexagon, Diamond shapes. CJ also practiced writing the shape names and she had fun labeling them. I love simple projects - they are often the best and nurture the imagination! What a great idea! I'll have to try this with my pencil obsessed little girl! fun idea. I'm teaching my son's preschool lesson on shapes in a few weeks. I'll have to try it. Great idea, this may also be a great attention keeper activity using crayons at a restuarant! Thanks for sharing!